Location: Better Business Bureau, 10019 W. Greenfield Ave.
Join the Loose Bead Society of Greater Milwaukee (LBS) for a night of demos and discussion on powder coating with a former editor from Art Jewelry magazine. Attendees will receive a small take-home kit (including metal blanks and powder) to explore and play with this medium on their own. Additional powder-coating materials and finished pieces will also be available after the presentation. This class has sold out the last several years, so be sure to reserve your seat early! And don't let the image fool you — this year we'll be playing with new powder colors and a wider variety of blank shapes. 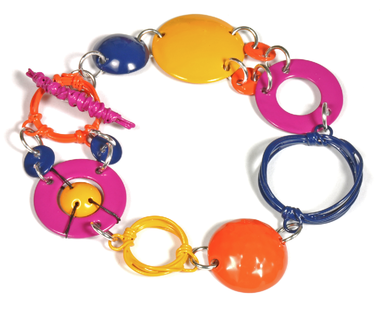 Join a former editor from Art Jewelry magazine to learn about the latest jewelry-making trend in this playful, crash-course in powder coating. Using a simplified coating process of dipping instead of spraying the powder coat, you will learn how to easily add durable color to your metal jewelry. Theresa will also briefly introduce you to a fluidizing bed -- a simple tool that makes it easy to apply an even coat of powder on your metal. Learn how to prepare the metal blanks, apply the powder, and cure the powder to create a colorful bracelet, necklace, or an assortment of components to use in your jewelry designs. ​Learn how to safely and simply (and inexpensively) apply a proprietary blend of glow powder coat for a durable, glow-in-the-dark finish to metal components. Create your own wearable galaxy that comes to life when the lights go off -- and learn how to powder-coat metal while you’re at it! Join a former editor from Art Jewelry magazine to explore a proprietary blend of glow-in-the-dark powder coat. This all-levels powder-coating class combines a simplified coating process with watercolor painting techniques to complete an out-of-this-world creation. Learn how to prepare the metal, apply the powder, and cure the powder to create a one-of-a-kind pendant necklace (or more, if time allows).. The Meet the Teachers Reception is your chance to visit with your favorite teachers (ahem, this should include me), get acquainted with others and take an up-close look at the wonderful array of class projects being taught this year. Shop for kits, classes and specialty products directly from the Bead&Button Show instructors.